Summertime Oaks (G2) winner Ollie’s Candy is offered as a racing prospect. Ollie’s Candy has recorded three wins and two seconds in five career starts, all in 2018, for earnings of more than $250,000. She flashed her talent immediately, winning her career debut in April by 6½ lengths, followed by a 7¾-length allowance win in May, both at six furlongs at Golden Gate. Ollie’s Candy successfully graduated to graded stakes company in her third start, defeating top fillies in the Summertime Oaks at Santa Anita in June, her first race on dirt and her first attempt at two turns. She displayed her gameness in that effort when she hooked the pacesetter and engaged in a duel through the stretch to prevail by a neck at the wire. She finished second by a neck in the San Clemente (G2) in July and Del Mar Oaks Presented by The Jockey Club (G1) in August, both over the Del Mar turf course. She overcame challenges in the one-mile San Clemente, her first start on turf, to run what is described as the best race of her career. In a testament to her athleticism, Ollie’s Candy broke from the outside post, was forced to go wide in the first and second turns and still rallied from far back in the stretch to just miss at the wire. A 3-year-old filly, Ollie’s Candy is by leading sire Candy Ride (ARG) out of 2009 Appalachian (G3) winner Afternoon Stroll. 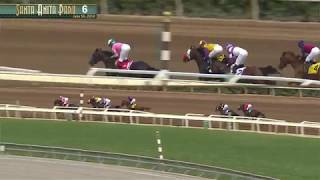 Won 2018 Summertime Oaks (G2) at Santa Anita against top stakes company. Finished first or second in each of her five career races, all in 2018. Won or placed in graded stakes on dirt and turf. By top sire Candy Ride (ARG) out of Grade 3 winner Afternoon Stroll.